This is People’s World correspondent Al Neal’s last dispatch from London reporting on Brexit—Britain’s departure from the European Union, originally scheduled for March 29. His next report will be from Brussels, Belgium, where the EU27 will be meeting. Neal’s earlier coverage of Brexit is available here. And speaking of nightmares, the similarities between British Prime Minister Theresa May and Donald Trump keep growing—a worse hybrid than the 1980s Ronald Regan/Margaret Thatcher “trickle down” team. Following a tumultuous day in the House of Commons yesterday, where May found herself trying to maneuver against any attempt by Speaker John Bercow to block of the third vote on her Brexit deal, MPs again found themselves divided on how to move Brexit forward with only eight days left before a hard crash out of the European Union. Parliamentarians have already twice rejected May’s Brexit plan, largely over the contentious issue of the Irish “backstop.” Ireland remains a member of the EU, while the U.K.’s Northern Ireland is scheduled to leave along with the rest of Britain. With past violence in the region on their minds, everyone wants to make sure there is no hard border imposed between the two Irelands. But Brexit advocates are concerned that if the details of this backstop are not resolved, Britain could become trapped in a customs union with the EU, thus defeating the purpose of the country’s departure from Europe. 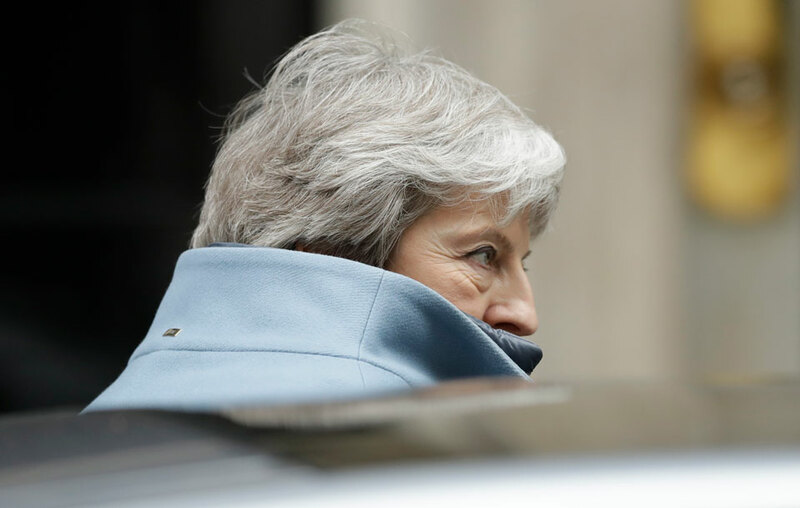 The lack of legal clarity in May’s deal surrounding the backstop has been a major dividing line in Parliament. But yesterday, MPs found themselves united thanks to May’s use of the blame game—a Trump specialty. May addressed the British public yesterday evening from Downing Street, letting them know she was “on their side” and laid Brexit’s failure on MPs shoulders. May also said she was committed to working to gain the support of her colleagues but was not prepared to delay Brexit beyond June 30—leading many to speculate she may resign if unable to secure a short-term extension. Anger erupted from Parliament, and May was immediately warned by enraged MPs that her “incendiary and irresponsible” national address could have cost her the desperate support needed to pass her withdrawal deal. “Build the Wall” and “Deliver Brexit.” Two goals oversimplified to nothing more than political rally cries that ignore the far-reaching social and economic implications of the policies they propose. The difference is that on this side of the Atlantic, unlike Trump, May doesn’t have much of a support base backing her right now. The real U.K./EU divorce drama will begin today as May, along with Labour leader Jeremy Corbyn, travel to Brussels to argue for their different plans and visions for Brexit, and a post-Brexit relationship. Yesterday, May formally requested a short Brexit extension be granted by the EU leadership. European Council President Donald Tusk said such a short extension would only be possible if MPs agreed to pass the existing withdrawal agreement—the same one it’s rejected twice already. For his part, Corbyn warned May that her “concerted campaign of blackmail, bullying, and bribery” had already failed to gain her the support of Parliament and said voters should be given the chance to reject her Brexit deal themselves and change the government. He renewed his call for a general election. Britain’s top trade union federation, the Trades Union Congress, meanwhile, issued a rare joint statement together with the major employers’ organization, the Confederation of British Industry, pleading with the government to avoid a “no-deal” Brexit on March 29. 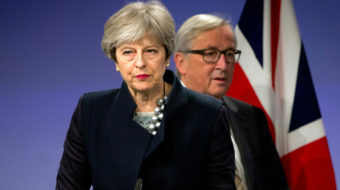 An open letter to May, signed by the heads of both groups, characterized the situation facing the country as a “national emergency.” Saying the threat of a no-deal divorce is escalating, Frances O’Grady of the TUC and Carolyn Fairbairn of the CBI argued that the shock to the economy “would be felt by generations to come” and said a new “Plan B” must be crafted that “protects workers, the economy, and an open Irish border.” They are demanding a meeting with the prime minister. May’s government has said it will put forward another Brexit motion before MPs on Monday, and a third vote on the Brexit deal may be held Tuesday or Wednesday next week. The EU Council has scheduled an emergency summit for next week where it could propose a longer extension to negotiations, with conditions attached, including, trashing May’s current proposal, calling for a general election, or even a second public vote.